5/19 Cup of Coffee: The PawSox rose past the Tides on the back of a an outstanding pitching performance, Portland and Greenville had tough nights, and Salem dropped both ends of a tightly contested doubleheader. 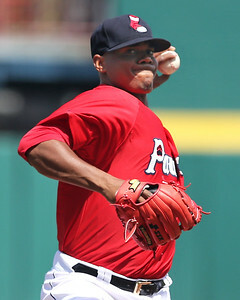 Roenis Elias (pictured) picked up his first victory as a member of the Red Sox organization. He tossed 7 2/3 innings, allowing two runs on five hits while striking out a career-high 13 without a walk. Elias's 13 strikeouts is the most for a PawSox hurler since Jin Ho Cho struck out 15 in 1999. Anthony Vavaro picked up his first save, hurling 1 1/3 innings of scoreless relief, striking out three. With the game scoreless in the second, a Chris Marrero solo home run and a Deven Marrero RBI single gave the PawSox a 2-0 lead. Leading, 2-1, in the seventh, Pawtucket padded its lead as Bryce Brentz came home on a throwing error. Brentz and Chris Marrero led the PawSox with two hits apiece. Justin Haley had a rough outing, recording just one out as he allowed four runs on two hits and four walks. Nik Turley had the longest outing of the five pitchers who saw action, allowing three runs on four hits and a walk over three innings. He struck out six. Cole Sturgeon's solo home run in the first and Wendell Rijo's RBI ground out in the second accounted for Portland's only runs. The Sea Dogs managed just three hits and were held without a hit after the fourth inning. In the first game of a doubleheader, Salem blew an early 4-0 advantage as they fell in 10 innings. Matt Kent received the start and pitched well, allowing just two hits and three walks while striking out six in six shutout innings. German Taveras struggled in relief, allowing three runs on three hits in just 1/3 of an inning. Jake Drehoff took the loss, allowing three runs on four hits and three walks in three innings. Salem got off to a quick start, plating three runs in the first on bases loaded walks by Nick Longhi and Danny Mars. Mike Meyers added a sacrifice fly. In the sixth, Meyers scampered home on a wild pitch to extend the lead to 4-0. After Lynchburg tied the game in the bottom of the seventh, the Red Sox reclaimed the lead in the top of the eighth on a Jordan Procyshen RBI single. The Hillcats tied the game in the bottom half of the inning, and eventually brought home the game's winning run in the bottom of the tenth. It was another close contest in the second game, as a late Red Sox rally came up short. Yankory Pimentel took the loss, allowing three runs on two hits and five walks in three innings of work. Jamie Callahan tossed three innings of relief, allowing one run on two hits, striking out three. Down, 1-0, in the fourth, the Red Sox tied the game on a Danny Mars RBI ground out. Facing a 4-1 hole in the seventh, Salem rallied for two on a sacrifice fly from Yoan Moncada and an RBI single from Deiner Lopez. Unfortunately for Salem, Rafael Devers grounded out with the tying run on second. It was a rough day all around for Greenville, who fell in a game that was shortened by rain in the bottom of the eighth inning. Logan Boyd picked up the loss, allowing seven runs on 11 hits in just 3 1/3 innings. Jeffry Fernandez relieved Boyd, allowing three runs on five hits in 4 1/3 innings. The Drive mustered just three hits, bringing in their lone run in the fifth on a Trent Kemp RBI ground out. Player of the Night: Roenis Elias gets the nod. He picked up his first win of the season as he hurled 7 2/3 innings, allowing two runs on five hits while striking out 13. The 13 strikeouts were the most for a PawSox hurler in 17 years and the highest total of Elias's career. The 27-year-old left-hander is 1-3 with a 4.96 ERA in six games (five starts) this season for Pawtucket.